LA may be in the (101-degree!) throes of Indian Summer, but even when the temperature drops, I still won't be hanging up my beachy bohemian blouses. 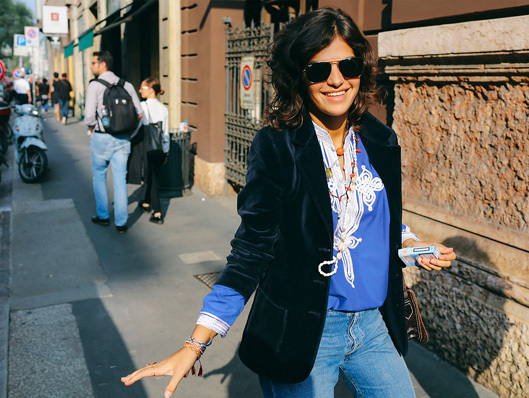 As this Milanese fashionista proves, these tops transition seamlessly into cooler temps with a fall-ready velvet blazer, like this or this, (her is by Saint Laurent) and jeans. I'd also team by boho tops with these chill-proof pieces my J.Crew, Vince, Etoile Isabel Marant, Madewell, Figue, Scotch and Soda, and Amanda Uprichard.